Pokémon breeding is a method of obtaining a new Pokémon by producing and hatching an Egg. Pokémon can be bred by leaving two compatible Pokémon at the Pokémon Nursery at Paniola Ranch on Akala Island. Two Pokémon are compatible if they are of the opposite genders and are of the same species (or share at least one Egg Group). 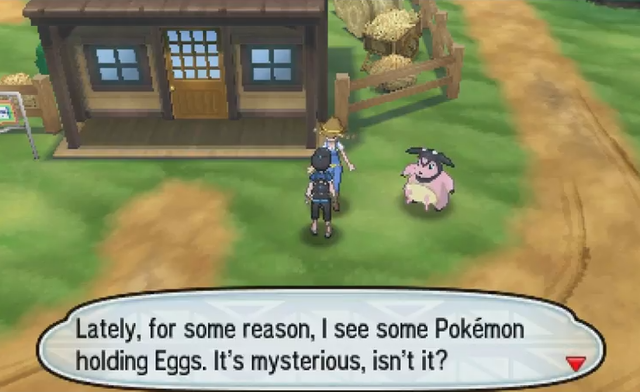 Alternatively, breeding is usually still possible as long as one of them is Ditto, even if the other parent is genderless, and in fact, genderless Pokémon can breed only with Ditto. Pokémon in the Undiscovered egg group cannot breed whatsoever, and Ditto cannot breed with itself. The chance of any two Pokémon producing an Egg is determined by their species (two Bulbasaur are the same species, while Bulbasaur and Ivysaur are not) and their Original Trainers. The chance is higher if the Pokémon are of the same species and also if one of them comes from another Pokémon Trainer than the player. An Egg may be generated after every 257 steps you take. The chance an egg is generated increases if you have the Oval Charm in your bag, which you get after defeating Morimoto in the Game Freak office in Heahea City, after becoming the Champion. The amount of steps needed to hatch an egg differ per species and are mentioned on each Pokémon page in our Pokédex. After taking enough steps, the Egg will hatch into a level 1 first-stage Pokémon of the female species' (or non-Ditto parent's) evolutionary chain. In the case of Pokémon families where the male and female are different species (female and male Nidoran, and Illumise and Volbeat), an Egg produced may hatch into either the male or female variant. There are several Pokémon which can produce two different kinds of Eggs, dependent on whether or not a parent of the Egg held a specific incense when it was produced. For example, if a Snorlax is holding an Full Incense while breeding, it will produce a Munchlax Egg. But if it doesn’t hold the Incense, it will produce a Snorlax egg instead. There are ways to speed up the time required to hatch an Egg. Riding a Tauros reduces the time required simply by making it faster to complete steps. The amount of steps needed is halved if a Pokémon with Flame Body or Magma Armor is in your party. Having multiple Pokémon with the Ability or one with each will not increase the steps reduction. By default, the baby Pokémon will start with any moves that it learns at level 1. If the father or the mother knows any specific Egg Moves that the baby can learn, the baby will inherit the move. If the parents both know different Egg Moves, the mother's Egg Moves are passed on first, then followed by the father's. For a baby Pichu, if either parent is holding a Light Ball, the Pichu will know Volt Tackle. Volt Tackle cannot be passed down as a normal Egg Move. If this would result in the baby possessing more than four moves, the moves take priority in the order listed: Volt Tackle, mother's Egg Moves, father's Egg Moves, TM moves, inherited level-up moves, baby's default moveset. Next to moves, a Pokémon's individual values (IVs) are also passed down. The baby will inherit three IVs, each from a different stat and from a random parent. The other three are determined at random. If either parent holds an item that enhances effort values (EVs) – excluding the Macho Brace – the baby will instead receive the IV of the corresponding stat from that parent, then inherit two other random IVs each from a random parent. For example, if a parent is holding the Power Anklet, the baby will inherit the Speed IV from that parent, and it will also inherit two other different IVs from its parents. If both parents hold an EV-enhancing item, the baby will inherit the corresponding stat to their held item from one of those parents at random. For example, if one parent holds a Power Anklet and the other parent holds a Power Weight, the baby will inherit either the Speed IV from the first parent or the HP IV from the second parent, and it will also inherit two different IVs from its parents other than Speed or HP (whichever was successfully inherited will be the one not chosen). If at least one parent holds a Destiny Knot, the baby will inherit five IVs instead of three. This can be combined with an EV-enhancing item to ensure that one desired IV is always inherited. If one parent holds an Everstone, its Nature will always be passed down. If both parents are holding an Everstone, a parent's Nature will still always be passed down, but which parent's Nature is passed down is randomly determined. Females have an 80% chance of passing down their Ability. If a male or genderless Pokémon has their Hidden Ability and is bred with Ditto, it has a 20% chance of passing it down to their offspring. Ditto's Ability is always irrelevant to inheritance. If an Egg does not inherit its Ability from a parent, it can only be born with one of its non-Hidden Abilities. The Poké Ball of the female Pokémon will be passed down to its offspring (except if it’s a Master Ball or Cherish Ball, which result in the default standard Poké Ball). Male and genderless Pokémon pass on their Poké Ball if bred with Ditto. Additionally, males can pass on their Poké Ball 50% of the time when breeding with a female of the same species (the exact species, so pre-evolutions and evolutions do not count). There is a 1 in 683 chance (normally 1 in 4,096) of hatching a Shiny Pokémon when the parents are from games from different countries. This mechanic is known as the Masuda method, after Junichi Masuda. If you own a Shiny Charm, it will further increase the chance of hatching a Shiny Pokémon to 1 in 512.